Dmitry Vladimirovich Andreikin (Russian: Дмитрий Владимирович Андрейкин, born 5 February 1990) is a Russian chess grandmaster, World Junior Champion in 2010 and Russian champion in 2012. Andreinkin won the world under-10 championship in 1999. He tied for 1st-3rd with Konstantin Chernyshov and Alexei Kornev at Lipetsk 2006. In 2008, he won the 4th Inautomarket Open in Minsk and tied for 3rd-7th with Rauf Mamedov, Denis Yevseev, Vasily Yemelin and Eltaj Safarli in the Chigorin Memorial. 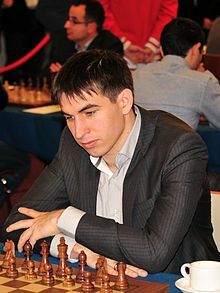 In 2009, he tied for 1st-3rd with Yuriy Kuzubov and Rauf Mamedov in the category 16 SPICE Cup A tournament at Lubbock, Texas. He won the 2010 World Junior Chess Championship in Chotowa, Poland. In the same year, he tied for 2nd-7th with Alexey Dreev, Ivan Sokolov, Vladimir Fedoseev, Alexander Areshchenko and Konstantin Sakaev in the Chigorin Memorial. In 2011, he tied for 2nd-3rd with Emil Sutovsky in the Baku Open. In February 2012, tied for 4th-8th with Alexander Khalifman, Maxim Rodshtein, Fabiano Caruana and Hrant Melkumyan in the 11th Aeroflot Open. In August 2012, Andreikin won the 65th Russian Chess Championship in Moscow after winning a rapid playoff against five other players. In the Tal Memorial played in June 2013, Andreikin was the lowest rated player, but he went through the tournament undefeated with eight draws and a win against Vladimir Kramnik, which gave him a shared third to fifth place. In the Chess World Cup 2013, held in Norway from 11 August to 2 September, Andreikin finished in second place, losing to Kramnik in the four-game final match 1½-2½. This result qualified him for the 2014 Candidates Tournament. In October-November 2014 he scored a major success in the second leg of the FIDE Grand Prix in Tashkent, winning the tournament ahead of Hikaru Nakamura, Shakhriyar Mamedyarov, Fabiano Caruana and eight other elite grandmasters. His score of 7/11 gave him a performance rating of 2852.